Thought threads. Lots of pieces. Fragments. But there is one thing arising that started a few days ago. I’m taking a workshop with Jude Hill. “Considering Weave” is the focus this go-round. It has me outside my comfort zone. I like that. And part of the intention is to explore weave structures as weave strengthens cloth or embellishes existing cloth– providing a matrix for exploration as only Jude can do. I missed the first week of the workshop and have been playing “catch up.” Looking at other student’s work. Not really “listening” so much as looking. 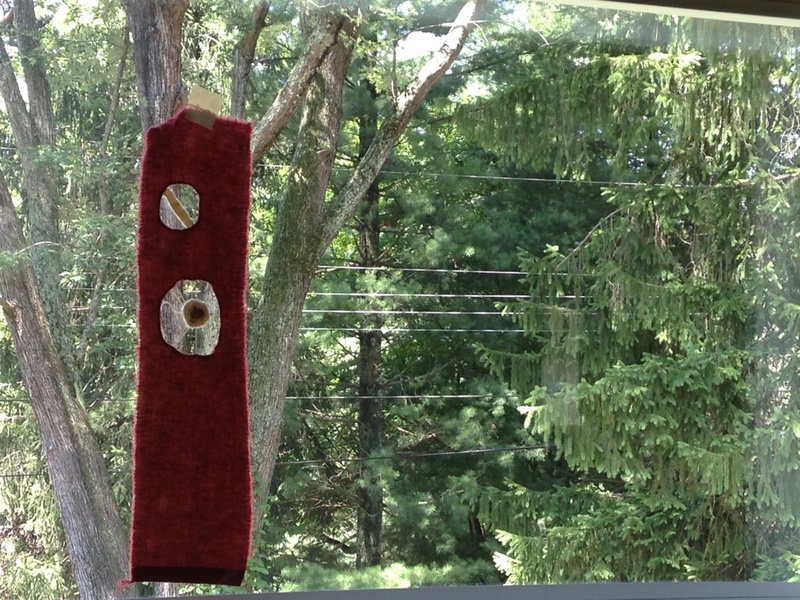 And so I had an idea–based on a window screen I made in 1969. Then I had taken a piece of burlap–a big piece–dyed it purple, machine stitched various enclosed shapes and then pulled out the weft threads inside the shapes. I loved it. It created visually interesting open patterns popping out of the field of purple. 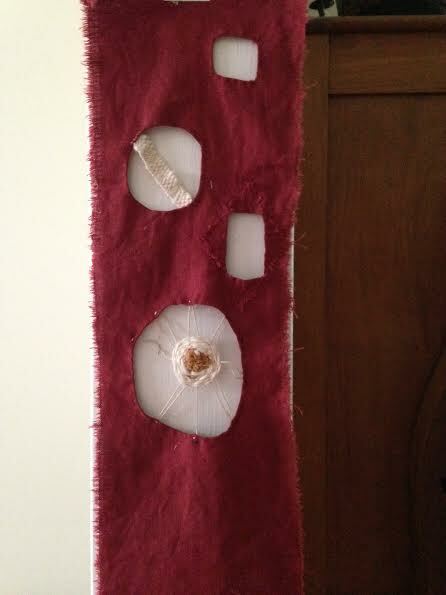 So I was thinking about that purple piece when I took a piece of red linen and started cutting shapes. Shapes that would hold some amount of woven interest. 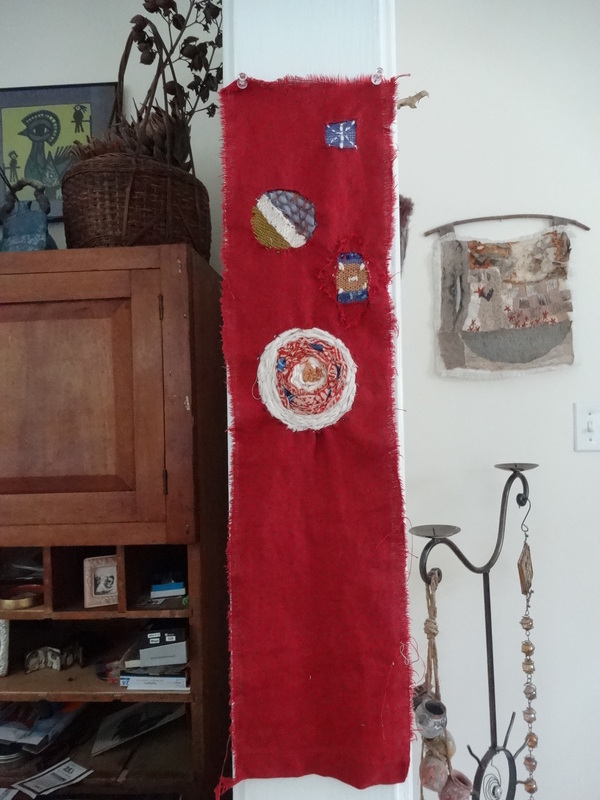 I had been thinking about perception/deception and point-of-view when I started hacking up the red linen. And I wanted to express for self the relevance/irrelevance of being attached to a point of view. That’s what I wanted. But it’s not what the linen wanted. And even though I really loved how it looked, I had chosen the wrong fabric for this project. The linen lost its integrity. It began collapsing in on itself. Folding and draping. Melting almost. This morning, in an effort to return “spine” to the cloth, I re-wove binding strength into the holes I had excavated. They are just okay. So so. The cloth maybe isn’t quite as strong as it was…it’s changed…but it weathered the storm. So. Respecting. Respecting the nature of . . . . Things. People. Self. Not pushing against. Not wanting to change something against its will. Against its nature. Ah. And that leads me back to–acceptance. Again, the lessons of cloth. Garden. Producing like crazy. Little rain really, but the ground is so heavily mulched that watering hasn’t really been necessary. 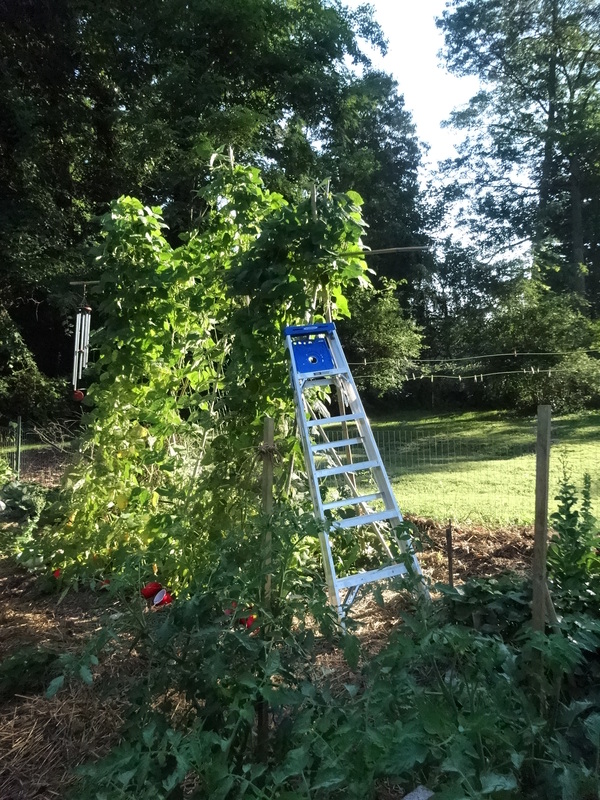 The pole bean trellis is straight out of Jack and the Beanstalk. Ladder needed for picking and yesterday one of the bamboo supports gave way while I was about six feet in the air. I had already scoped out my landing pad when it broke. 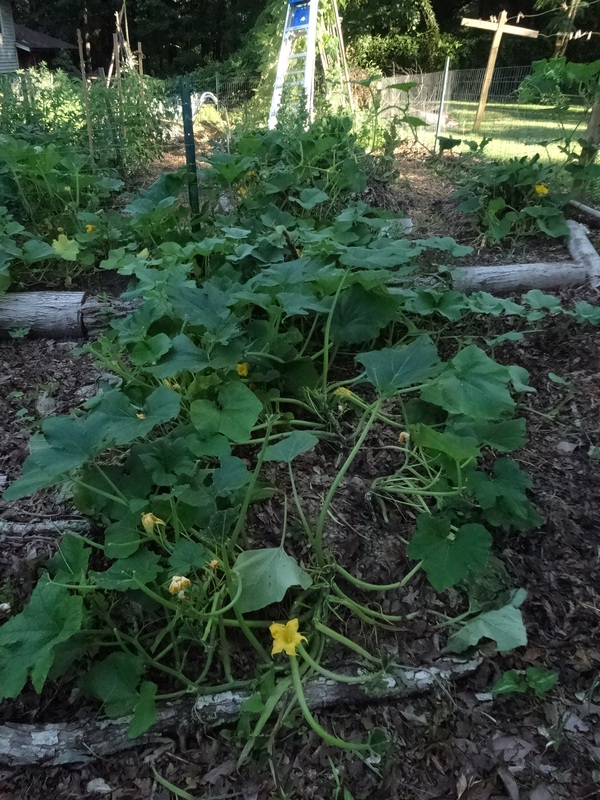 Groundhogs are wreaking havoc in the squash patch. The fencing on this part of the garden is plastic. The gate was one I made, weaving bamboo together. Clearly an optimistic gesture. Because it deters NOTHING. And to date I’ve hauled off 4 groundhogs to various locales and now I’m thinking they’re hip to the havaheart trap. It’s baited with honeydew but being ignored, and honestly, I’m always relieved when I look out the window and its empty. Squash will probably recover. 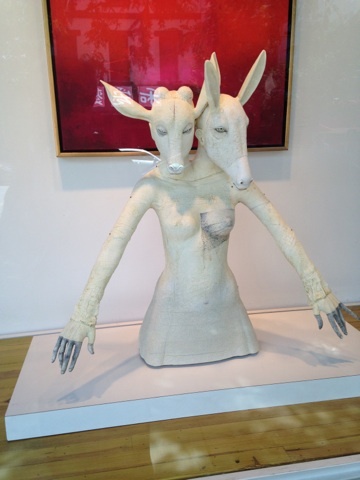 Sculpture in a downtown storefront. Asheville, NC. Sorry I don’t know the artist. 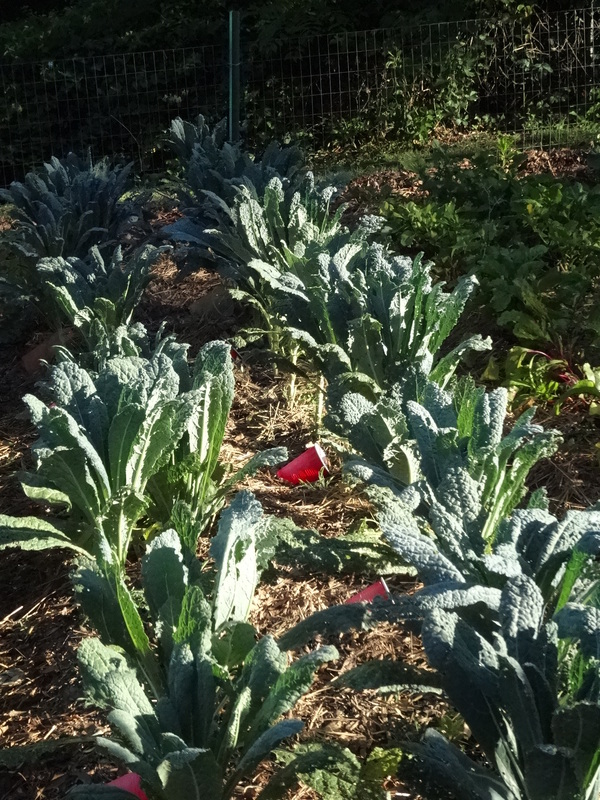 & wow what a bountiful garden! thanks Mo…yes, I loved it too. we’ll see it again! hi Cynthia! thank you for that…and thank you being here in community. that has appeared through the years…to watch it come and go, like a flock of birds, rising and swiftly passing only to return. watching. being still. it’s sometimes not comfortable, but i am letting it be what it is. Grace, thank you so much for all of this. i’m thinking about the expression “giving up” as you used it and it’s taking on a whole new meaning. giving up. giving. up. up. as in an offering. a turning over of … relinquishing the illusion of control. thinking about it in this way completely re-frames the idea. and yes, the garden is a wonder. and i’m sure it’s because i had help this year. three other women initially. dirt divas. one dropped out–hurt her back–and that left 2 others. then on Saturday –which is the communal working-in-the-garden day–my next door neighbor and two neighbors from across the street showed up as well, and wanted to work. to put hands in the dirt. to prepare seed beds. 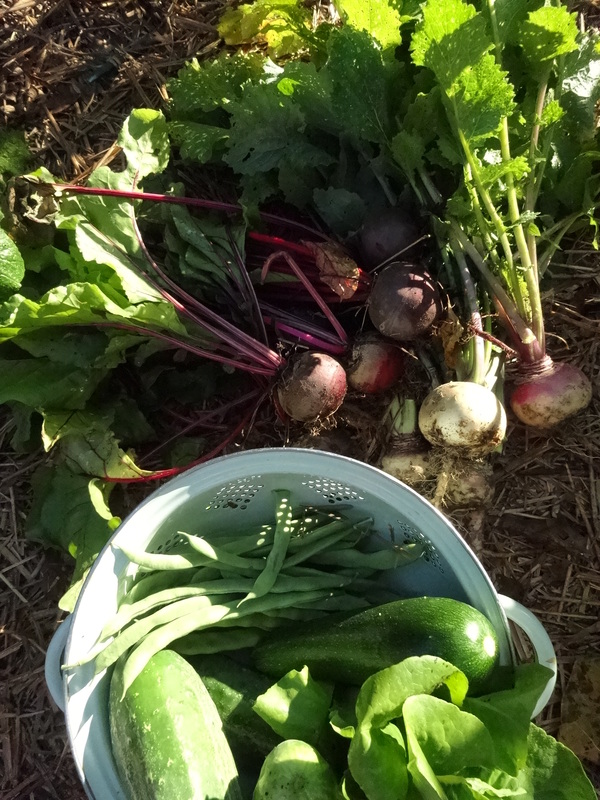 seeds to earth for fall harvest–beets, rutabaga, collards and bush beans. planted and watered. so it’s a fine thing, this gardening in community, and you would be so welcomed here. i will get downtown as soon as i can–inquire about the artist, try to shoot from various angles–points of view–and i will send them to you. so glad you’re here. so very, very grateful. yes….giving up. when it happens of it’s own accord i love it…. counter for a few days now. giving up leave a lot of new room for thought, i think when we accept we stop fighting that thing we perceive to be outside ourselves, allow it in. like eating it in a way, it nourishes us. i just so much love this thought…. like Tadpoles. like tadpoles eat their tails……. alchemy then…the unexpected result of non-resistance.